29 Sep What Is Vinyasa Yoga? There’s never been a better time to get into yoga. With new studios popping up on every corner it’s never been more accessible and the chances are, there’s a studio in your neighbourhood. With so many options, it can be hard to work out where to start or what style of yoga might be best for you. Should you try a hot class or one at room temperature? Do you jump into a Bikram, hatha, vinyasa or yin session? And what’s the deal with acro-yoga and aerial yoga, let alone classes with DJs and naked yoga? At Power Living, we specialise in vinyasa yoga – a dynamic style of yoga that’s physical and deeply satisfying. So if you’ve got all these choices – why choose vinyasa? The word vinyasa comes from the Sanskrit term nyasa, meaning ‘to place’ and the prefix vi, meaning ‘in a special way’. In vinyasa yoga, the body moves in sync with the breath, creating fluid and smooth movements, known as “flow”. Vinyasa yoga is an athletic style of practice and classes can be held in heated or non-heated rooms. Vinyasa stems from Ashtanga yoga – as taught by Krishnamacharya and popularised by Sri Pattabhi Jois. Ashtanga yoga prescribes a specific sequence of postures, each held for five breaths with each transition taking only one breath. What makes vinyasa yoga unique is the freedom and diversity of each class – there is no single philosophy, “guidebook” or sequence that teachers must follow, allowing individual personalities to shine. Every vinyasa class will be unique, letting different teachers and styles of yoga influence the flow. This allows for creative sequencing, a fun and vibrant flow and a challenging practice. Still not convinced? As well as improving strength and flexibility, vinyasa yoga is also a surprising source of cardio. The rapid movements and changes in stance elevate the heart rate and get the blood pumping. Vinyasa yoga works the entire body; resulting in more calories burned, increased agility and mobility and helps to maintain healthy bones and joints. Yoga is functional exercise, meaning that the body works in union with all systems and parts. This style of movement helps to increase our body awareness which, combined with the cardio benefits of a regular vinyasa yoga practice, can result in weight loss. Vinyasa yoga also builds strong bones and muscles, helping us to maintain a high metabolism, healthy posture and an active body. In a study by researchers from Maryland University, the health benefits of yoga were even found to outweigh those of aerobic exercise for improving balance, flexibility, strength and energy levels. Looking for some time out? Beyond the physical benefits of a strong vinyasa practice, classes have been proven to help calm the mind, reducing stress and anxiety. Yoga and meditation evoke a relaxation response – the opposite of stress in the body. The Yoga Health Foundation has also seen the results of just one hour of daily yoga lowering blood pressure, cholesterol and resting heart rates through a number of trials. These drops result in a healthy heart and work alongside low stress levels to maintain a healthy body and mind. 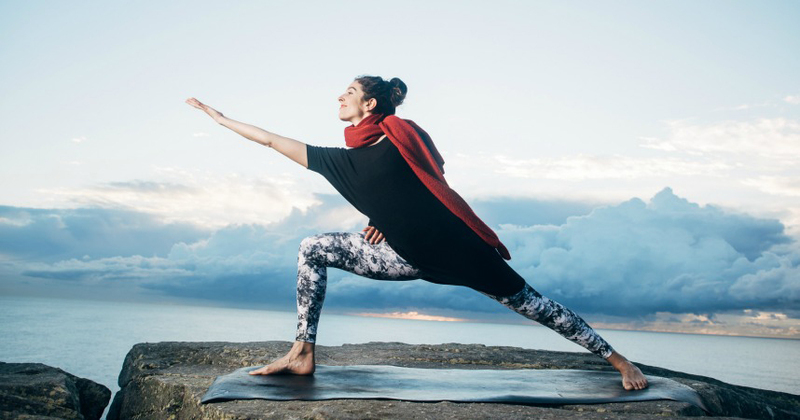 If you’re looking to improve your fitness, connect with your breath and flow – vinyasa yoga might just be right for you. Why not try one of our classes in studio this month? Can’t get to a Power Living studio? Check out www.YOGAHOLICS.com.au – our new online yoga platform!